The Civil Aviation Development Investment Program is upgrading 22 airports in Papua New Guinea to make air transport safe, affordable, and reliable. Photo credit: ADB. Multitranche financing supports an investment program to improve the safety, accessibility and reliability of Papua New Guinea’s airports. Improving air transport is crucial to Papua New Guinea’s economic and social development, and the key to improving connectivity in the country. The Civil Aviation Development Investment Program, a project supported by a multitranche financing facility from the Asian Development Bank (ADB), is establishing a sustainable civil aviation network for Papua New Guinea by improving airport facilities and services, and building the capacity of civil aviation agencies. The project offers lessons for large-scale development projects that require long-term investments. Papua New Guinea’s air transport system requires serious upgrades. Its airports are deteriorated, posing a threat to air safety. Air navigation systems are outdated and unreliable. Flight cancellations are frequent, operations are restricted, and the cost of airline operations is high. Airlines are losing business; their closure would disable international trade and restrict domestic mobility and tourism. Improving the air transport sector is crucial to the country’s economic and social development. Papua New Guinea’s rugged terrain and extreme climate make road construction difficult, which is why the country has no safe and extensive road network. Being an archipelago, the country relies heavily on aviation as a major transport mode. It has more than 450 aviation facilities, including 22 national airports, mostly located in provincial capitals, and hundreds of rural airstrips. The Jacksons International Airport, in the capital Port Moresby, serves as the main gateway for the country. Four major airlines—Air Niugini, PNG Air, Qantas, and Philippine Airlines— plus more than 20 other operators offer international and domestic flight services. Passenger traffic has grown yearly by about 10% on average, aircraft movements by 5%, and freight demand by about 4%. These rates are well below the growth in gross domestic product, which has averaged 6.4% in recent years. Two key institutions administered, regulated, and managed the civil aviation sector. The Department of Transport was the lead agency for transport strategy and planning, while the Civil Aviation Authority was responsible for airports, air traffic management, and regulatory oversight. Strengthening the capacity of these institutions has been a major government priority. Approved in 2009, the Civil Aviation Development Investment Program involves long-term investments, covering a span of 10 to 20 years. It aims to support the government’s targets in strengthening civil aviation. Sustainable investment plays a critical role in not only tackling capacity constraints and deteriorating infrastructure, but also in providing long-term maintenance. Dilapidated and unmaintained infrastructure threaten the safety certification of airports and place socioeconomic objectives at risk. The government and ADB agreed that a multitranche financing facility was the most suitable mode of financing because it supports medium- to long-term investment programs derived from a country’s sector road map. It offers countries a fixed credit line for project loans, with reduced commitment fees and flexible long-term management setup, which is suitable for large-scale sector development. Papua New Guinea’s National Transport Development Plan 2011-2020 provides the overall policy framework, with the key objective of reforming the Civil Aviation Authority to become self-sufficient and fund the maintenance of airports and airways. The Civil Aviation Authority’s infrastructure investment plan for 2010-2030 serves as the sector’s development road map. ADB and Papua New Guinea entered a framework financing agreement to guide project development under the investment program and prepared a facility administration memorandum to guide project or tranche implementation. ADB has provided a credit line of up to $480 million to help fund the investment program. The Government of Papua New Guinea has allocated $85 million. Financing is provided in tranches, based on the government’s submission of the related periodic financing requests, execution of the related loan agreements, and fulfillment of the terms and conditions and understandings set forth in the agreement. These tranches, consecutive but overlapping, have financed specific projects or sets of projects under the investment program, initially focusing on priority actions to comply with international security and safety standards, and then on increasing capacity for growth in services. The first project, amounting to $112 million, involved physical improvements in several national airports to comply with international safety and security standards and supported the restructuring of the Civil Aviation Authority. The second project, costing $170 million, further improved airport infrastructure, upgraded air navigation services, and enhanced operations of the civil aviation agencies that evolved from the restructuring of the Civil Aviation Authority. Activities under the first project were completed in 2015, while activities under the second project are nearing completion in 2017. The third tranche of $248 million targets improvements and long-term maintenance, and includes airport asset management, further upgrades, and capacity development. The first project financed the restructuring of the Civil Aviation Authority in 2010, aimed at decentralizing aviation functions. 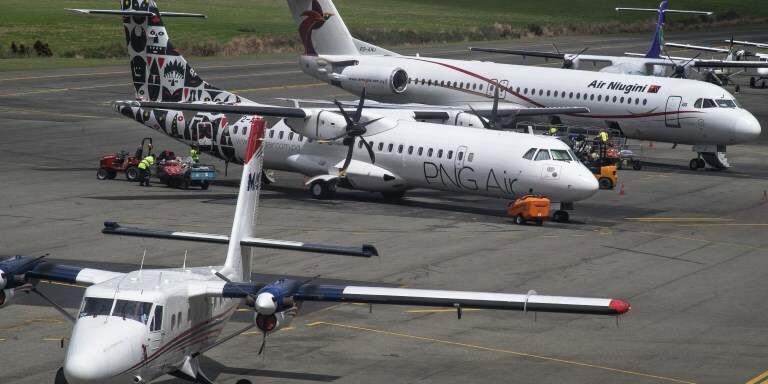 It has resulted in the establishment of three autonomous state-owned enterprises: National Airports Corporation, Papua New Guinea Air Services Limited, and the Civil Aviation Safety Authority. The project also supported the National Airports Corporation in engineering design, preparation of bid documents and procurement, and preparation of investment proposals for subsequent projects and tranches for ADB approval. The second project focused on strengthening and sustaining the operation of these three institutions. The physical and technological improvements of Papua New Guinea’s airports require rehabilitating airport infrastructure, including runways, taxiways, and aprons; improving runways and passenger terminals that can accommodate larger aircraft; and upgrading communication, lighting for night operation, navigation, surveillance, and firefighting equipment. The first project prioritized improving pavements and fencing in Wewak, Hoskins, Gurney, Mount Hagen, and Jacksons airports to comply with international safety and security standards. Together, these airports serve about 1.5 million people. New security fences in Kavieng and Goroka airports were also installed. Equipment for communication navigation and surveillance were modernized to meet air traffic management requirements. Fire safety and rescue equipment were procured to meet operational requirements. The second project focused on establishing the civil aviation network and improving connectivity among the airports through communication and navigation technology upgrades. Facilities and infrastructure in Goroka, Girua, Chimbu, Vanimo, Momote, and Buka airports have been upgraded and/or rehabilitated. Firetrucks and navigation systems were procured. In addition, capacity development and strengthening activities for the new aviation agencies were conducted. Financing of recurrent maintenance costs is also required to avoid the costly cycle of deterioration and rehabilitation, and ensure continuous safety and security certification. To ensure proper and sustained funding, the project maximized the recovery of operating costs, while tariff reviews took into account operation and maintenance requirements. Passenger terminal fees at the national airports were adjusted to match the need for terminal and infrastructure maintenance. Long-term maintenance contracts are an integral component of the investment program. Facilities of the 22 national airports were upgraded, and maintenance was improved to a specified standard under 10-year civil works contracts. The contracts are performance-based, with fixed monthly payments contingent on meeting the performance standards and defined penalties for underperformance. These contracts may be “unit rate” contracts to start with and convertible after 2 years into “performance-based” contracts. A related issue in long-term maintenance was retaining a qualified workforce. Many of the staff who have been trained left the project for better jobs; the project management team had to recruit and train new staff. Also, Papua New Guinea has been struggling to cope with skilled and semiskilled labor demands, and the project had to make do with the country’s limited workforce. When completed, the Civil Aviation Development Investment Program will bring safer and more efficient all-weather access to air transport services across Papua New Guinea. The restructuring of the former Civil Aviation Authority has been completed, and the newly established aviation institutions are fully operational. The National Airports Corporation now owns and operates the 22 national airports. It has gained experience in implementing the first project under the investment program and took over the Civil Aviation Authority’s role as executing agency. It has completed technical designs of civil works, including pavement rehabilitation, and security fencing. It has also led the preparations of projects for the third and final tranche of the program. The Papua New Guinea Air Services Limited provides navigation services, including communication, navigation, surveillance, and air traffic management system to domestic and international airline operators that use the country’s airspace. The Civil Aviation Safety Authority enforces and monitors adherence to industry rules and international standards. A Papua New Guinea Accident Investigation Commission was established in 2015. The staff of these aviation institutions have undergone training under the program. The first project improved the pavements and security fencing in the five priority airports—Wewak, Hoskins, Gurney, Mount Hagen, and Jacksons—in compliance with international safety standards. It installed security fences in Kavieng and Goroka airports. Hoskins Airport now has a new terminal building and the runway was extended and paved. A new terminal building for both domestic and international flights was also constructed for Mount Hagen Airport. At Jacksons International Airport, a new instrument landing system and domestic apron extension were installed, and firefighting vehicles were procured. The first project also saw the official opening of the upgraded Hoskins Airport in West New Britain, Western Province. Hoskins is expected to boost connectivity between West New Britain and the rest of the country and stimulate the local economy. The improvements included an extension of the runway to 1,900 meters, strengthened pavements, installation of a perimeter security fence, a modernized terminal building with an ecofriendly sewerage system, and solar-powered street lights around the terminal to boost energy efficiency. The second project installed security fencing at Momote and Buka airports. It upgraded pavements at Goroka, Girua, Chimbu, and Vanimo airports. Goroka airport now also has a new terminal building. The project modernized the airports’ aeronautical and navigation equipment, which include a radio aeronautical communication system, a secondary surveillance radar system, and airport rescue and firefighting vehicles. The Civil Aviation Development Investment Program offers lessons in administering large-scale sector development projects financed through the multitranche financing facility. A resource gap in experienced and qualified staff in the Civil Aviation Authority was holding back the development of Papua New Guinea’s air transport sector. The project implementation unit has also had a difficult time keeping trained people employed. Incentive programs to retain a skilled workforce are necessary for long-term maintenance of air transport facilities and services. Capacity building, not only for the project implementation unit but also for the staff of the different aviation agencies, is also needed. Developing a country’s aviation sector requires a huge amount of financing. Developing efficient and effective institutional structures and providing long-term support and capacity development in implementing the sector road map is crucial in projects financed through the multitranche financing facility. To eliminate the risk of conflicts of interest, operating and regulatory functions should be housed in separate institutions. Updated and rationalized fees linked to the demand created by expanded aviation services will also be realized. Continuous support for institutional development and for monitoring and evaluation through the investment program should be delivered through government systems. Asian Development Bank (ADB). Papua New Guinea: Civil Aviation Development Investment Program. ADB. Papua New Guinea: Civil Aviation Development Investment Program - Project 1. ADB. Papua New Guinea: Civil Aviation Development Investment Program - Tranche 2. ADB. 2009. Report and Recommendation of the President to the Board of Directors: Proposed Multitranche Financing Facility to Papua New Guinea for the Civil Aviation Development Investment Program. Manila. ADB. 2008. Mainstreaming the Multitranche Financing Facility. Manila. Civil Aviation Authority of Papua New Guinea. 2008. Strategic Investment Plan. Port Moresby.